At Swap Electrics we pride ourselves on being professional, on time and ensuring that we offer our clients the most reliable and cost efficient solutions. Our Team of electricans are fully qualified with years of experience and understand the needs of our clients. This is further backed up by the reviews posted on True Local where Swap Electrics holds the highest rating. To read the reviews click here. SWAP Electrics do all electrical, phone, data and maintenance jobs. Above all, SWAP Electrics can be counted on to be reliable and fair in terms of work, delivery and attitude. Swap Electrics can perform a range of services apart from electrical installation and repair. Our people are qualified in the installation of: entertainment systems including in wall cabling of flat screen televisions, phone, data, communications and pay TV installation, alarm systems and smoke detectors to name but a few. We are not a one man band but rather a professional team operating a service fleet. This means we can be on time and available earlier at a time that suits you. SWAP is fully insured as required of any company providing services on a commercial level. We can provide full electrical support contracts covering all business electrical requirements or just what you specify. 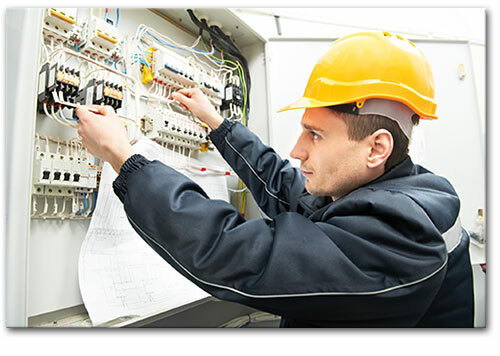 Our qualified electricians are capable of dealing with any commercial electrical needs from minor repairs, upgrades, data and communication connections through to full wiring install and / or maintenance. To find out what we can do for you, please Contact Us. Swap Electrics can supply and install security systems to meet your requirements. Test and tag equipment, issue Safety Certificates, create and update Tagging Log Book. Copyright Swap Electrics 2013 - 2019. All rights reserved.